The University of Maryland has announced the creation of a new cybersecurity seminar series made possible by a sponsorship from Google. The Google and University of Maryland Cybersecurity Seminar Series will feature a diverse group of speakers from industry, academia, and government, addressing a broad range of topics related to cybersecurity, including technology, policy, and economics. Invited speakers will also examine the impact that cybersecurity threats and protective measures are having on privacy, identity, social networks, business and national security. The new series will be organized by the Maryland Cybersecurity Center (MC-squared), a multidisciplinary initiative at the University of Maryland aimed at research, education, and technology development in cybersecurity. MC-squared brings together faculty experts from engineering and computer science with colleagues from across campus in fields such as information sciences, business, public policy, social sciences and economics, mirroring the comprehensive perspective of the new seminar series that places special emphasis on “the human factor” of cybersecurity. Google has committed to a three-year sponsorship of the new series, which will feature three seminars per semester, with a total of six per year. The series will kick off with a special talk by Dr. Vint Cerf, Chief Internet Evangelist at Google, on Thursday, April 7, 2011 at 5:00 p.m. on the University of Maryland’s College Park campus. The title of his talk will be "Can We Make the Internet Safer?" and the event will be held in the Jeong H. Kim Engineering Building Rotunda. Registration is required, and capacity is limited. Guests can register online at http://tinyurl.com/google-umd-cerf. Widely known as one of the "Fathers of the Internet," Vint Cerf is the co-designer of the TCP/IP protocols and the architecture of the Internet. In December 1997, President Bill Clinton presented the U.S. National Medal of Technology to Cerf and his colleague, Robert E. Kahn, for founding and developing the Internet. 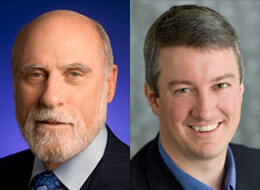 Kahn and Cerf were named the recipients of the ACM Alan M. Turing award in 2004 for their work on the Internet protocols. The Turing award is sometimes called the “Nobel Prize of Computer Science.” In November 2005, President George Bush awarded Cerf and Kahn the Presidential Medal of Freedom for their work. The medal is the highest civilian award given by the United States to its citizens. Prior to joining Google, Cerf served at the Internet Corporation for Assigned Names and Numbers (ICANN), MCI, and the U.S. Department of Defense's Advanced Research Projects Agency (DARPA), where he played a key role leading the development of Internet and security technologies. With nearly 20 years of industry experience in network security and embedded systems engineering, Roesch has dedicated himself to developing intelligent network security tools and technologies to address evolving threats. A respected authority on intrusion prevention and detection technology and forensics, Roesch has been interviewed as an industry expert in multiple technology publications, as well as print and online news services, such as MSNBC, Wall Street Journal, CNET, ZDNet, and numerous books. Roesch founded Sourcefire® in 2001 and is the author and lead developer of the Snort® Intrusion Prevention and Detection System that forms the foundation for the Sourcefire IPSTM. Roesch has received a host of awards of his technology innovation and vision. Most recently, he was recognized as a 2010 Security Superstar by Everything Channel's CRN magazine for the value his innovations provide partners and customers, and was selected as one of eWeek's Top 100 Most Influential People in IT. The third and final spring seminar will be held in June. An announcement regarding the speaker, date, and location will be made in late April. The University of Maryland offers an ideal location for seminars about the nation's growing needs in cybersecurity. The State of Maryland leads the nation in information technology jobs and more than half of the nation’s Internet traffic passes through the Washington, D.C. metropolitan area. The region is also home to U.S. Cyber Command and key federal agencies that focus on national cybersecurity, along with many area companies specializing in information assurance. The University of Maryland is also the alma mater of Google Co-Founder and President Sergey Brin. "This important sponsorship will allow us to bring a wide variety of distinguished speakers from across the nation to speak about the importance of cybersecurity and its impact on our society," said Prof. Patrick O’Shea, Co-Director of the Maryland Cybersecurity Center and Chair of the Electrical and Computer Engineering Department at the University of Maryland. "We are very grateful to Google for supporting our new cybersecurity seminar series." For more information, visit www.cyber.umd.edu.